The weeks into January 2006 have seen some progress with the much-needed strut cups finally procured via the great auction house of the internet. 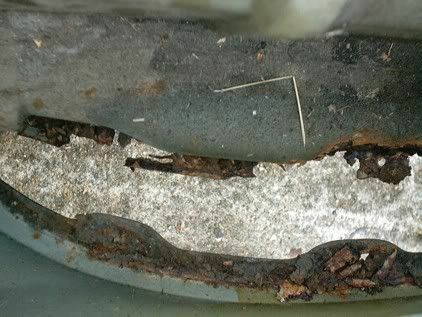 My long-distance welder (in Anglesey) confirms having received them and has started to repair the old struts. 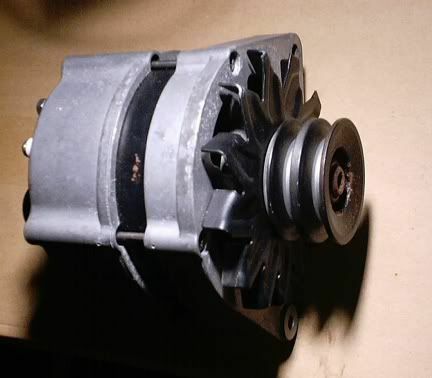 Meanwhile the car has received a new (or refurbished) alternator from the same said auction house and this seems to work fine. A trip to Halfords has allowed me to get some paint (aerosol and touch-in) for Bess's superficial defects here and there. All they needed was Bess's paint code (219-5) to be read from the panel above the radiator and the resulting colour is an exact match. A sort through the attic has come up with a front valance repair panel and repair panels for each sill. Could be handy when we reach that far-off goal of sending Bess to the local welder for much needed major works. Other minor trimmy bits needed for the front have been obtained and the hot air duct connecting the exhaust manifold with the air filter has been replaced with extentable aluminium tube - not very satisfactory but hopefully will work for a while. 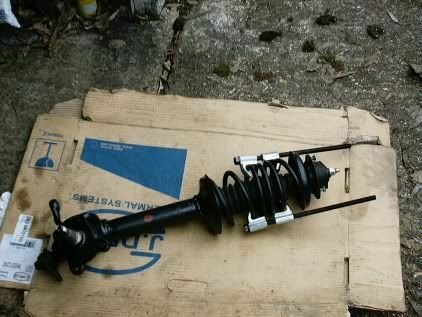 Finally in early February, the repaired struts arrive and are reassembled with the new shock absorber inserts. 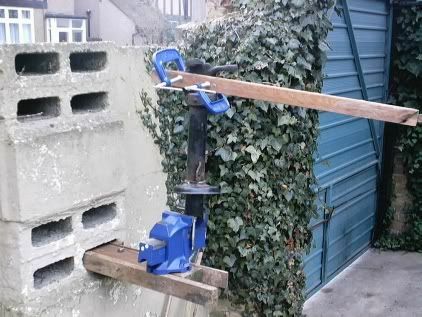 The top strut nut is tightened with the aid of a large vice and a wooden lever held in place by clamps. So far so good. 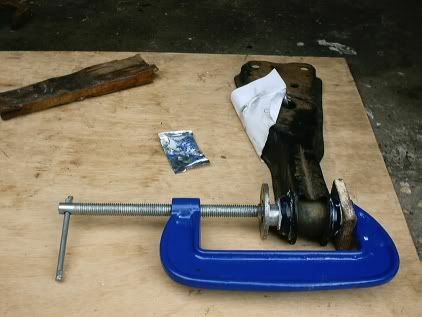 The struts themselves are then re-attached to their springs with the help of a coil spring compressor or two and, after a fair amount of fiddling about, they are ready to go back on the car. In reality they were fitted, removed and reassembled a few times to line everything up. 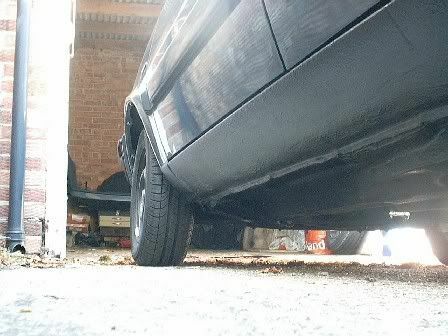 The weeks into Feb 06 have seen the struts refitted to the car and the radius arm bushes fitted as per photo below. The tie rods, radius arms etc have been bolted up loosely so that they can be tightened when the wheels are back on the ground. Unfortunately one of the brake back plate bolts sheared off in its hole which will necessitate drilling it out and re-tapping the thread. Needless to say things are going roughly in the right direction e.g. 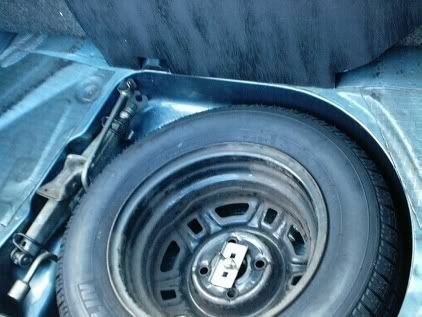 just beginning to fit the callipers and wheel hubs back. The broken bolt has been drilled out and replaced with a smaller one - alas could not re-tap the hole with my tap-and-die set. The callipers and disks are going back together more-or-less as they should. March has seen the front suspension reassembled fully and torqued up as required. The tracking has been set (see below) and now we are ready to move on to the next phase - sorting minor electricals for MOT and/or major welding. The weeks into April 06 have seen Bess's electrics sorted - all exterior, dashboard and console light are working. A major clear-out of rubbish and re-wire to the radio aerial. A better steering wheel has been fitted (no horrible smooth patches) and a few runs up-and-down the yard have shown that all is reasonably well with the steering and suspension. 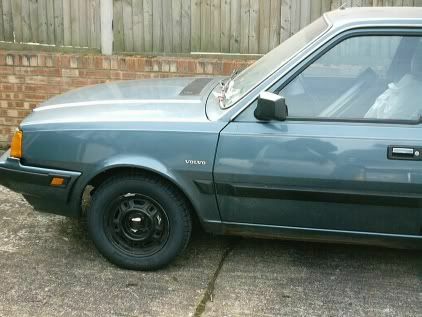 Alas the brakes will need more attention - the wheels refuse to lock up on full braking. Bess's jaw drops with laughter as she gets a new pair of mincers. 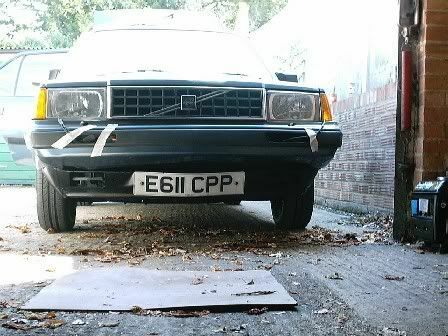 The pictures above and below show efforts to replace Bess's headlamps and wipers with new units (from the great auction house of the internet). 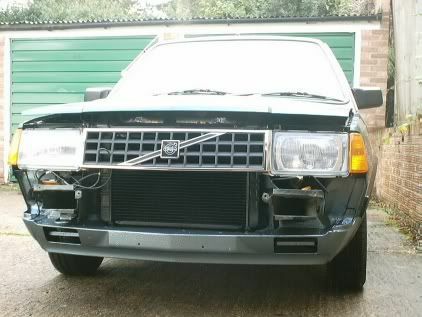 Everything under the front bumper looks remarkably rust-free and the headlamp washers and wipers all work. Blowing my own trumpet again is sure to guarantee another major hitch. 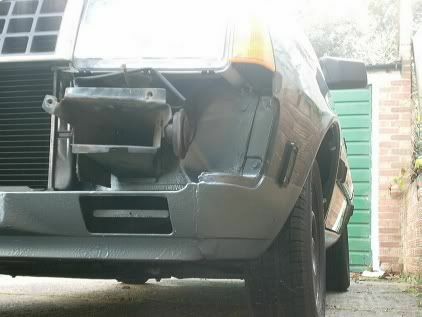 The rear bumper has been removed to inspect for rust and one rusted-through spot revealed itself (see below) - this will need welding later on. Removing the bumper bolts was no mean feat with one bolt breaking, another being bent and the threads on all were badly jammed up. 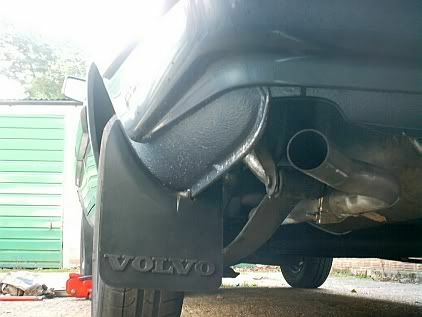 Anyhow a new set of bolts has been obtained and the bumper and exhaust refitted. 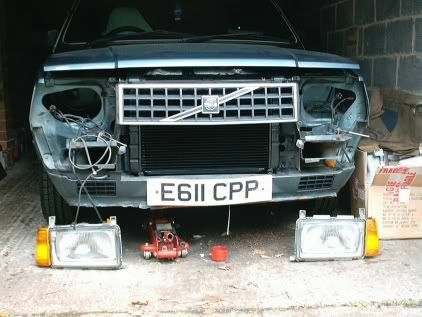 The headlamps and have been aligned and the wheel trims refitted. 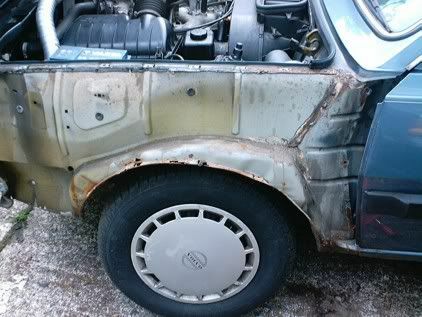 Its almost MOT time but a couple of worries crop up including the appearance of a thin blancmange inside the oil filler cap. 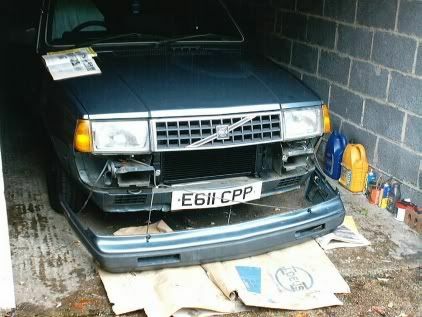 I will make do without a steering lock and will probably chance it with the brakes in the MOT test, following advice from the volvo300mania forum. The next couple of months (May-June 2006) were taken up with sorting electrical problems on another of my wrecks but the later weeks of July have seen some progress with Blue Bess. Most importantly the car was producing a strong smell of petrol whenever the engine had been run and I eventually found this to be due to fuel leaking from the from nearside box section which the petrol pipes run through. 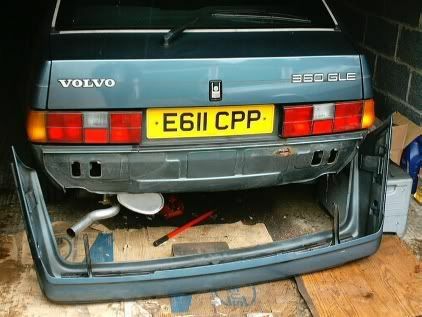 With help from the volvo300mania forum, the problem was traced to perished flexible hoses above and beside the petrol tank which were replaced by removing the heat shield under the car and lowering the petrol tank. The problem seems to 100% cured (in my unbiased view), the engine seems to be running well and a nearly new front grille has been fitted with proper clips! The only niggling worry is a strange shrieking sound from the top end which comes and goes, but its usually soon after startup, if at all. Its Friday 18th August and Blue Bess is booked in for a mid-morning MOT test - I need to find out exactly what's wrong with her from the professionals. I get to the car a bit early and feel nervous at the prospect of crossing one of life's great thresholds. The journey to the test centre is fraught with brakes that hardly seem to work, steering that creaks, groans and hurls me towards parked cars at every turn not to mention the smoke issuing prominently from the exhaust. On arrival at the test centre I am told-off for driving in through the front entrance (I thought that was what front entrances were for) and leave the car for an hour to catch up with my sleep in the local cafe. On returning I see Bess on the ramp and after some time, the MOT tester returns to the reception and says to his colleague 'That 'as 'ad may-jor work! Everyfing on its noo. F***ing crazy!' and a few minutes later, to my horror, they they tell me its passed. £44 later I have no complaints. 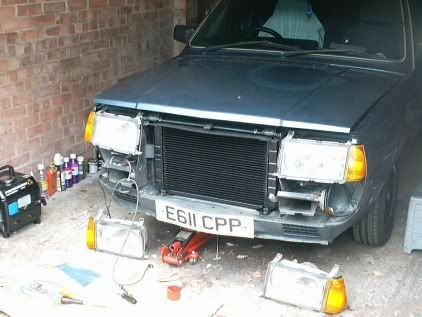 Now all it needs is new sills, front and rear valance, full welding to underside, painting and undersealing. Back at the garage, the next hour or two are spent starting to remove the front wings for the welder and getting over mixed feelings of jubilation and guilt that my paint-over-rust strategy has duped a poor boy into certifying this heap road-legal. The work to remove the front wings continues over the next couple of days and a peep behind them reveals a fair amount of rust in the wheel arch which will have to be replaced. August bank holiday weekend 2006 and the front wings have been removed and bolted back on loosely for ease of removal by the welder. 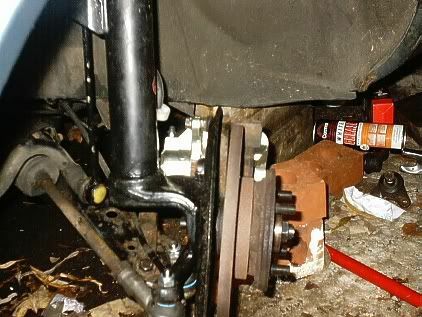 The worry about creaks and groans from the steering led me to suspect that I had previously fitted the strut-top thrust bearings upside down! 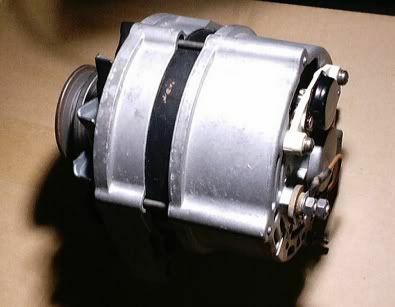 Finding one of the old ones in the garage left me in a cold sweat, convinced that I really had fitted them wrongly. Hence I decided to do the only thing that could be done...to remove one of the struts and check. The next couple of hours were spent removing one of the struts from a car that had just passed its MOT with flying colours. Dismantling the same said strut confirmed that all was well after all. The next couple days were then spent putting it all back together again, setting the nuts and bolts to the correct torque and checking the wheel alignment. No photos of this episode - its one that I would rather forget. The rest of the long weekend was spent fitting the front bumper back, removing odd bits and pieces and clearing the car out for the welder. 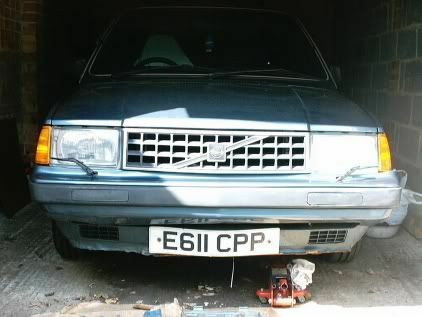 Things are happening fast (if that's possible with volvo 300's) - the car has insurance and its going to the welder for a quick look over soon and he might be able to work on it in the first week of September. 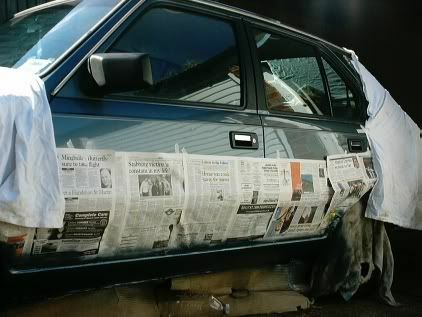 The weekend of 10 Sept 06 has seen the car returned from the welder with copious amounts of underseal applied to the repaired sections (as the pictures above and below will show). The poor man had to spend 32 hours on the job but the price was about what I hoped it would be - it could have been a lot worse. He seems to have done a good job all round to the valences, wheel arches and sills along with the boot floor and other places. Welders have a hard life and a habit of breaking some things while they repair others - Bess's boot board will confirm this. Anyhow, the next couple of hours were spent wiping off the overspray of underseal and lightly brush-painting over the boot-floor repairs. 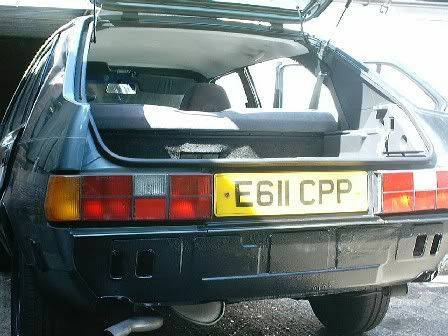 The weekend of 17 Sep 06 has seen the rear valance and lower edge of rear wings resprayed as well as the area around the rear number plate. The latter has been refitted with new screws and proper yellow plastic caps! 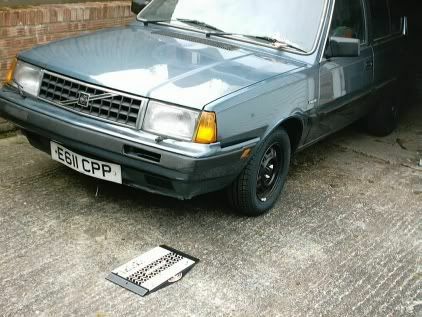 The rear bumper and sidelights, etc., have been refitted also and the boot floor given another light coat of paint. 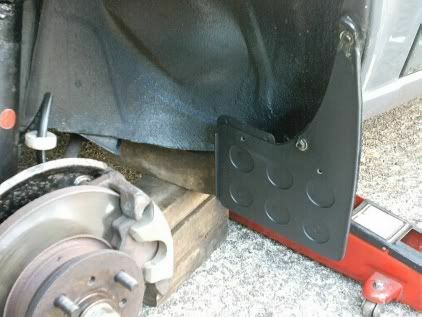 The front offside rear wing has been removed and waxoyled underneath before being fully bolted up all round. Some progress repairing Bess's broken parcel shelf but sadly a look under the car reveals that the trusty welder has missed a substantial bit of rust so I know the car is going to be on its way back to him soon. It had to happen. 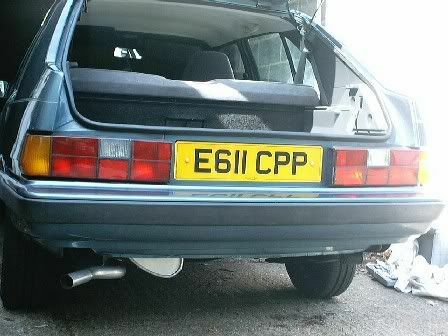 Nevertheless, the back end of the car is looking quite posh now. 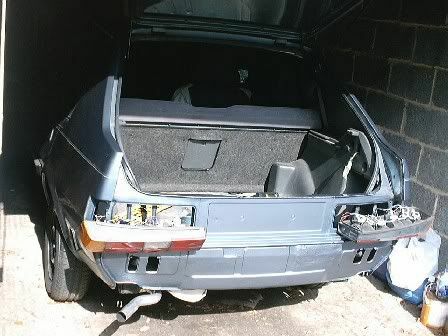 The weekend of 24 Sep 06 has seen the remaining front wing removed for waxoyling underneath and it was refitted. 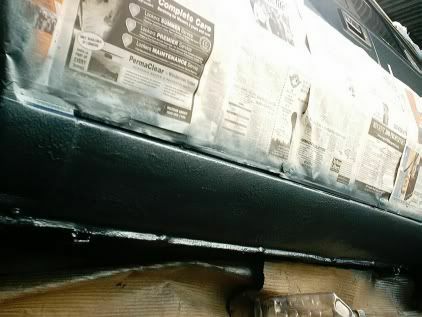 The nearside sill has been resprayed and the front valance has had the same treatment. 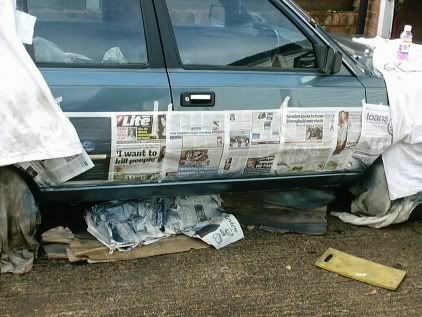 The weekend of 1 Oct 06 has seen the nearside sill sprayed up and the front bumper refitted to the car (second time lucky; the first time I forgot the plastic trim bits that are clipped onto the front valance). The repair under the windscreen washer reservoir has had the underseal removed and has been primed up for proper painting. The weekend of 8 Oct 06 has seen the repair under the windscreen washer reservoir repainted and the exterior paintwork of the car has been touched up with a fine brush. 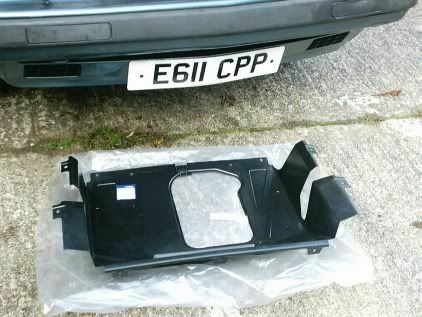 Starting to remove rust on the battery tray, the front number plate has been replaced and the plastic trim in the front valance refitted! 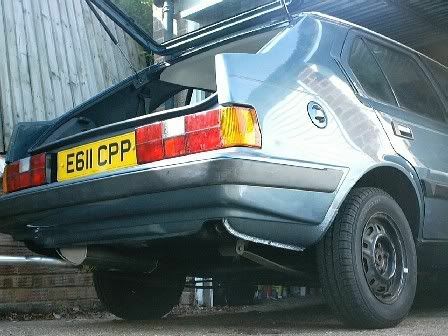 Next week the plan is to start on fitting the mudflaps and waxoyling the underside. 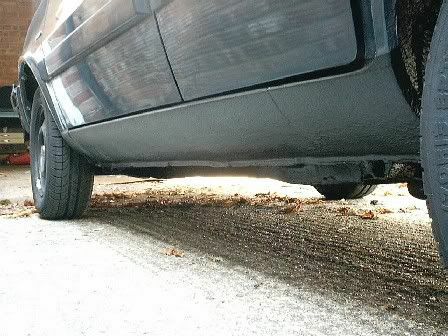 The weeks up to the end of October have seen mudflaps fitted all round along with a new engine splash panel and the underside has been waxoyled where its most needed. 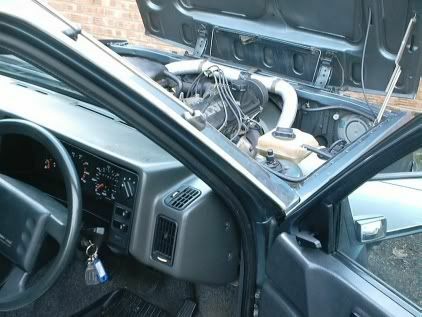 The front windscreen wipers have been replaced and the old battery refitted. Have made a mental note to get something done about the rust in the box section near the petrol tank which will require moving the petrol filler pipe and will provide a good opportunity to replace the jubilee clips holding it to the petrol tank. 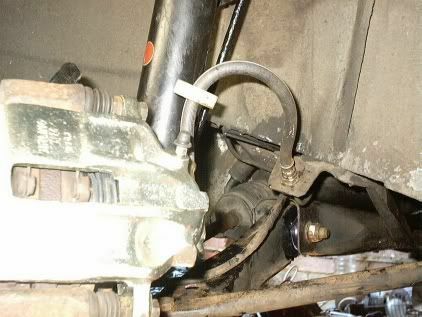 These clips can rust away and cause petrol leaks (according to the volvo300mania site)! The grommets in the bulkhead have been patched up with black draft excluder and the whole car given a clean and polish inside and out!